In this cruel world, thank heavens for men like quiet hero for the animals, Richard Hoyle. This beautiful soul inspires us with hope – and immense gratitude for his selfless labour of love. I promise, it really is worth reading this brief article to the end. 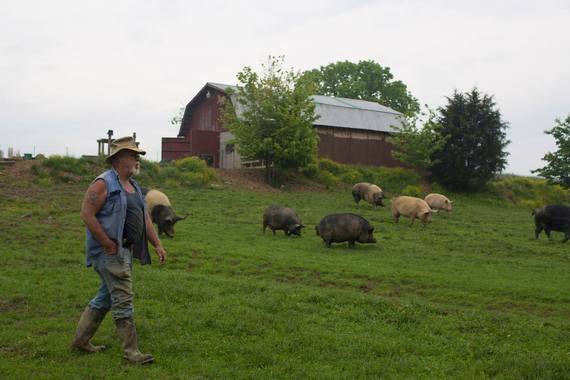 So says Richard Hoyle of The Pig Preserve, his sanctuary in rural Tennessee. If you passed Richard Hoyle on the street, you’d never guess that he’s a long-time vegan and animal rights activist. Nearing his 70th birthday, Richard is a self-described “crusty old conservative.” He’s also eloquent, wise, humble, and funny. 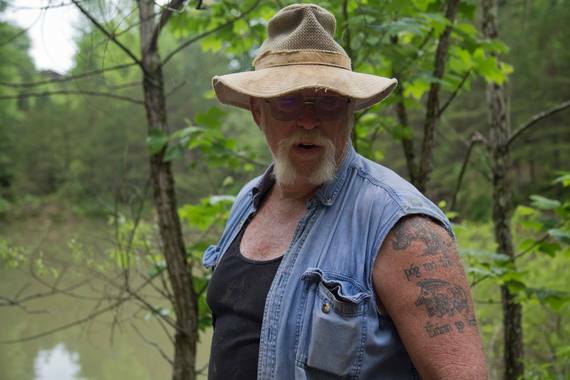 But you probably won’t pass Richard Hoyle on the street, and that’s because he works dawn until dusk 365 days per year at his sanctuary for rescued pigs, The Pig Preserve, in rural Tennessee. 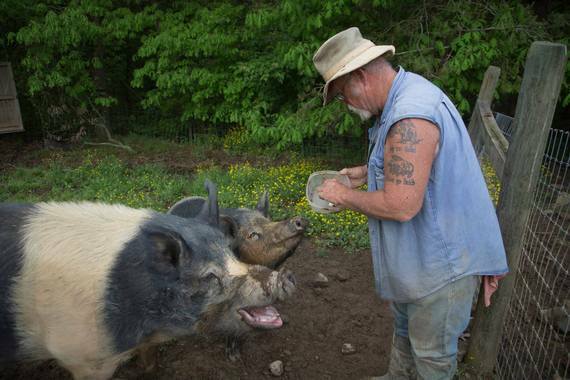 The Pig Preserve is an innovative farm sanctuary. Situated on 100 acres of natural land, the pigs move about in social groupings, foraging for some of their own food and exploring woods, pastures, and ponds. The result is that the busy and largely self-sufficient pigs enjoy as natural a life as possible, and the Pig Preserve is less labor-intensive and more cost-effective than a traditional farm animal sanctuary model. But maintaining this idyllic setting for the pigs is actually a massive undertaking. Most of the pigs are fed once a day, but the younger pigs—who are less capable of foraging—are fed twice daily. The pastures have to be maintained against the constant rooting of the pigs. Elderly and sick pigs receive daily medical care, and on hot days, they all get extra attention to make sure nobody is overheating. The barns are kept clean and comfortable with bedding. Each day is a new challenge. Richard says he will wear many hats over the course of a day—as a farmer, carpenter, electrician, plumber, fence repair man, tree cutter, tractor mechanic, small engine repairman, veterinarian, and more. Richard says farm sanctuaries are essential to the animal rights movement. Many smaller sanctuaries all over the world rescue and care for animals quietly, efficiently, and professionally. In the process, they educate people, telling the animals’ stories and raising awareness in an informal and personal way. “We do not get out and protest but we do bear witness every morning when we get up, put on our dirty clothes and walk out the door to care for those precious few who have been spared the horrors of the factory farms and the slaughterhouses. We live our activism 24 hours a day, 365 days a year—often to the serious detriment to our health and certainly to our pocketbooks. “Rescuing an animal is only the beginning of the story. Once the trailer bringing a rescued pig arrives through my gates, I will be responsible for the safety and care of that pig for the rest of his or her life. In many cases that will be for another 15 to 20 years. “I will spend time with that pig. I will heal his or her physical injuries and I will invest countless hours healing the emotional damage that has been done to this poor creature. I will show this pig each and every day that he or she is safe, loved and respected as a fellow sentient being. “And, at our sanctuary, I will also teach this pig how to be a pig. I will encourage the pig to wander the fields and woods, to graze in the fields, to root and forage in the forest, to swim in the pond and, most importantly, to live his or her life in the company of other pigs where pigs are the happiest. “I will try to show each pig that not all humans are like the ones he or she experienced before they arrived here. I will show each pig that it is okay to trust humans. I will be there for that pig every day of his or her life. “And, when it is time, I will be there to ease that pig’s suffering and help him or her make the trip across Rainbow Bridge. And I will bury each pig with my own two hands—kneeling to say a prayer over the pig’s grave. And I will thank God for the privilege of knowing, loving and caring for that pig. “I will also say a prayer for the millions upon millions I could not help. The Pig Preserve is always in need of donors and volunteers. Learn more about them on their website, follow them on Facebook, and consider making a donation. Photos by Anita Krajnc of Toronto Pig Save, on trial for giving water to thirsty pigs headed for the slaughterhouse. Next postMeat to Come with Health Warning Label?